Before the fall of 1987, I had never heard of Love and Rockets, or Daniel Ash. I hardly ever listened to the radio, (except for news or baseball games), or watched MTV during 1984 - 1987. I had seen "The Hunger" in 1984, and liked the band playing during the opening credits, and loved the song they were playing, but the band's name (Bauhaus) was so foreign to me, that I couldn't remember it after I left the theater. It wasn't until I read an article in Creem magazine in 1988 that I realised the connection between Bauhaus and L&R. One afternoon in October 1987, I saw the video on MTV, for "No New Tale To Tell". At first, I didn't like it because the singer (David J) seemed weird, and I really disliked the fact that this band seemed to have ripped off an old Alarm video, (for "The Stand"), with the words written on the wall behind the band. But, then Danny took off his shades, I was struck by how lovely he looked! By the end of the video, I was ready to forgive these people, since I also had grown to like the song. The next month, November, I went back to my old school, Indiana University of Pennsylvania, to visit some friends who were still there. I noticed signs for a concert that Love and Rockets were doing the following week at the school's Fisher Auditorium. I would have liked to have gone, (I was that impressed with the song - and Danny! ), but I couldn't afford the bus fare to go back to Indiana for it. 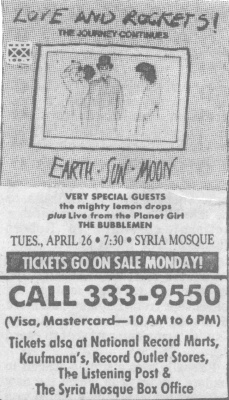 In March 1988, when I had a job and could afford it, I bought "Earth Sun Moon". I liked it enough. Then I bought "Express", after seeing the video for "All In my Mind" on MTV's 120 Minutes show. I liked this album much more. Then the concert in April was announced. I bought a ticket, (it was such a bad seat, that I actually bought a second, better one the night of the show), and spent the next weeks, getting terribly, (probably overly), excited, and talking to the new L&R poster I had bought in Clearwater, Florida several weeks before the show. I even bought some new clothes for this show, (which I'm ordinarily too cheap to do). Surely, no concert could live up to the expectations I was putting on this one! The Bubblemen seemed a bit weird to me, I had no idea who or what they were. Then Love and Rockets came on. And totally blew me away!!! I didn't recognise all of the songs, but I loved everything I heard. (The only bad thing was all the dry ice - it was seriously drying out my contact lenses.) This concert absolutely lived up to my expectations! I didn't want to go home. I wasn't thinking of trying to meet the band, I just wanted to extend the night, (and to heck with the French test I had the next morning!). Well, I started talking to some people outside the Mosque, and eventually I found myself going with two other women, to the Marriott Hotel in Greentree (outside the city), to search for L&R. We walked down all the halls, got ourselves tossed out once, (but we snuck back in), and bothered one poor guy who we thought had some connection to the band. But, no luck finding any band members. I ended up paying for the taxi ride home for the three of us. For the rest of the spring/summer of 1988, I spent a good chuck of my hard-earned money from my part-time job at Sears beginning to buy up the back catalogue of Love and Rockets, then Bauhaus and Tones on Tail. I started by buying the "Seventh Dream of Teenage Heaven" album a few days after the concert. I also read all the magazine articles I could about the band. And started to wait for the next time Love and Rockets would come through Pittsburgh - and I would know what they were playing. Copyright © 2002, 2004, 2009 Vivian Campbell. All rights reserved.